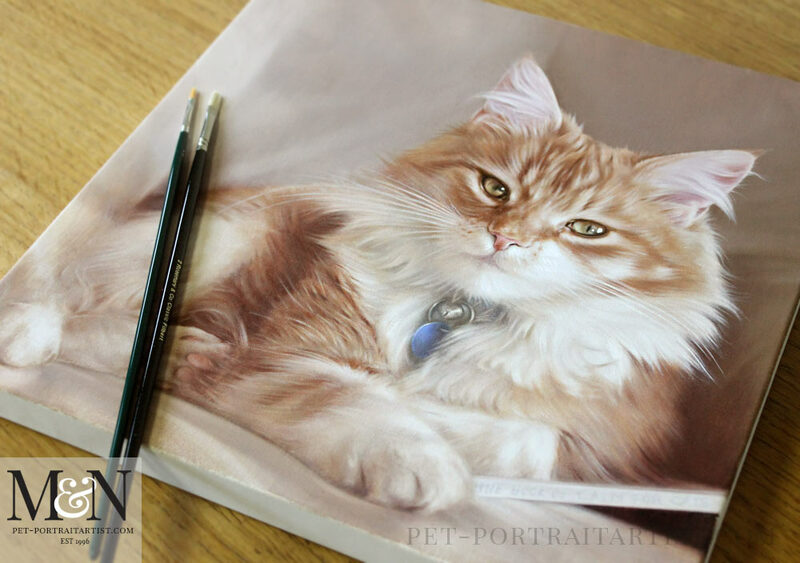 Welcome to Nicholas’ latest cat portrait in oils of Dudley. 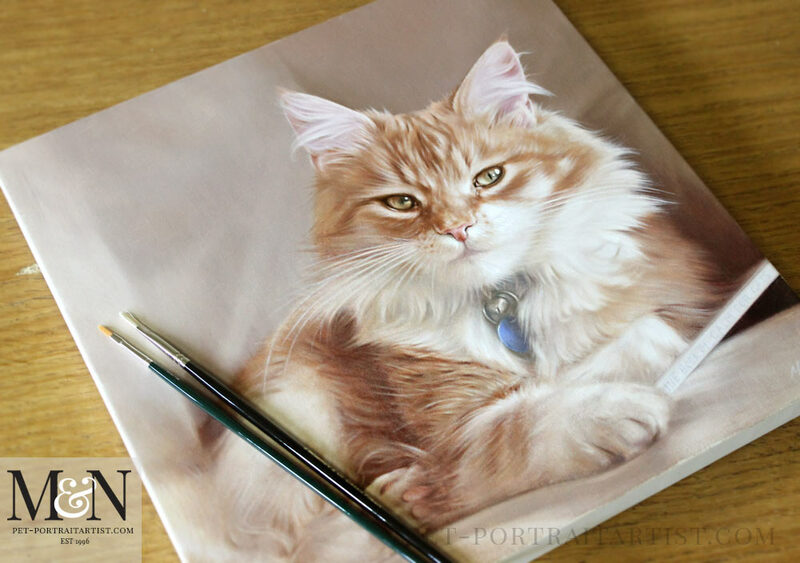 This commission has been utterly delightful and we have really enjoyed working with our clients from the outset. 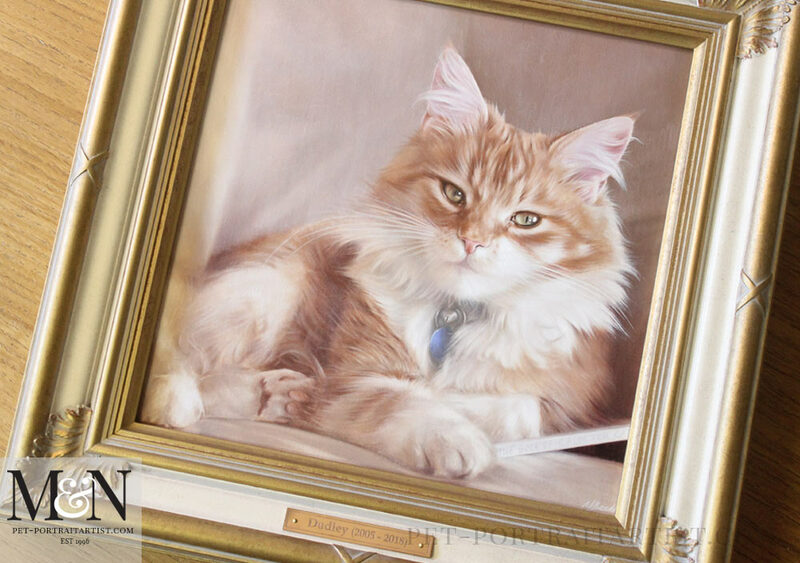 Dudley sadly passed away during the commissioning process, so this painting will serve to be a wonderful reminder to our clients Gordon and Kirstie from Scotland. 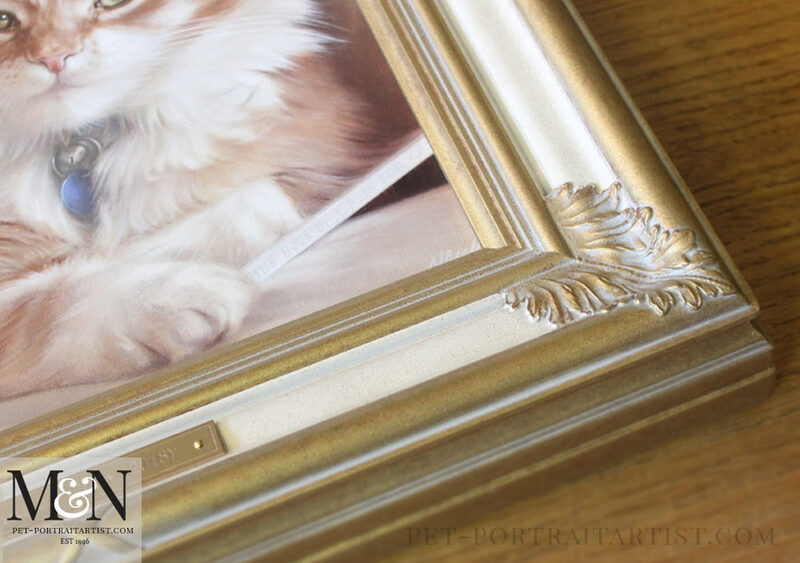 The painting is a 14 x 14 oil portrait, traditionally hand painted by Nicholas Beall. 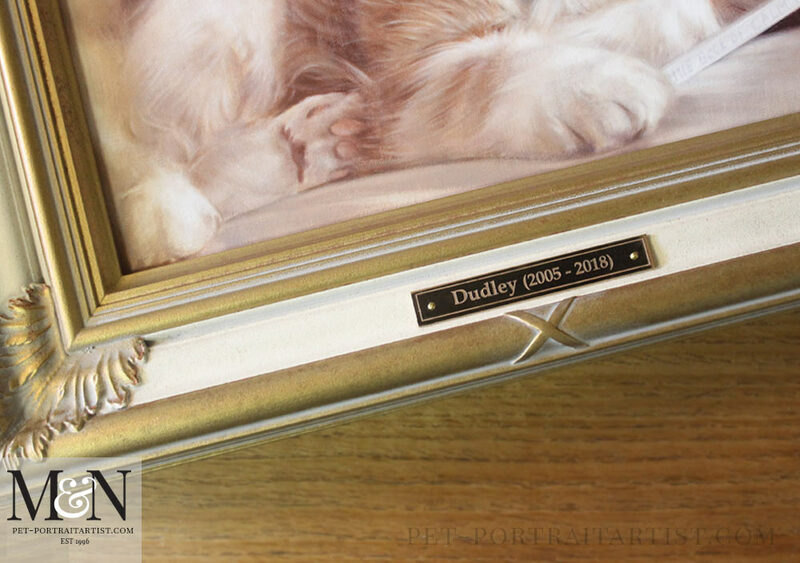 Scroll down to view the lovely photos of Dudley framed, a video of the frame and his painting and also photos of the portrait in progress. 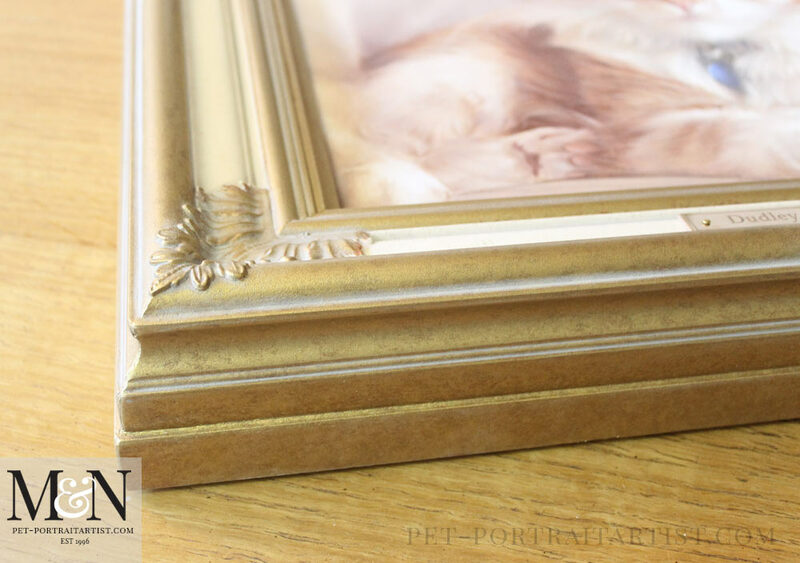 ……Words cannot express our delight with the framed portrait – I was in tears it is so beautiful. Everything about it is perfect. …. 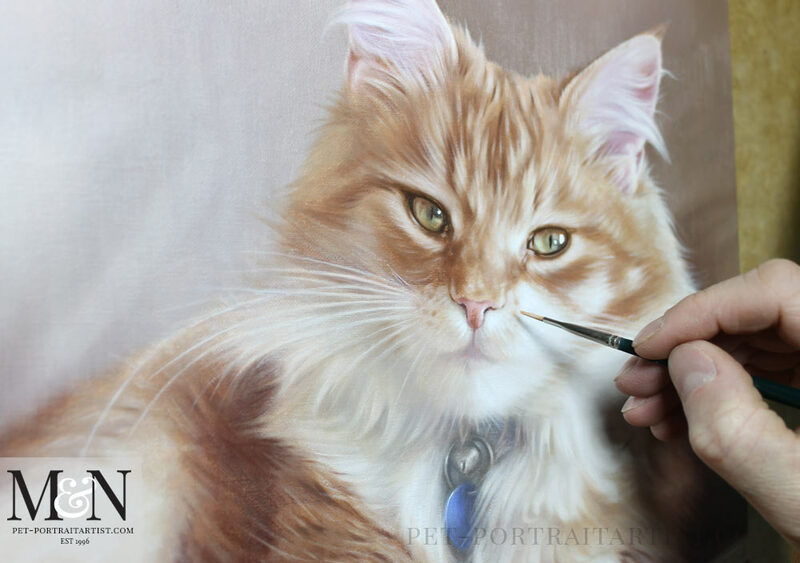 Thank you so much again for all your painstaking trouble keeping us updated, it has all been great fun and it is hard to believe that Dudley will soon be hanging on our wall…..
Cat Portrait in Oils – Happy Clients! 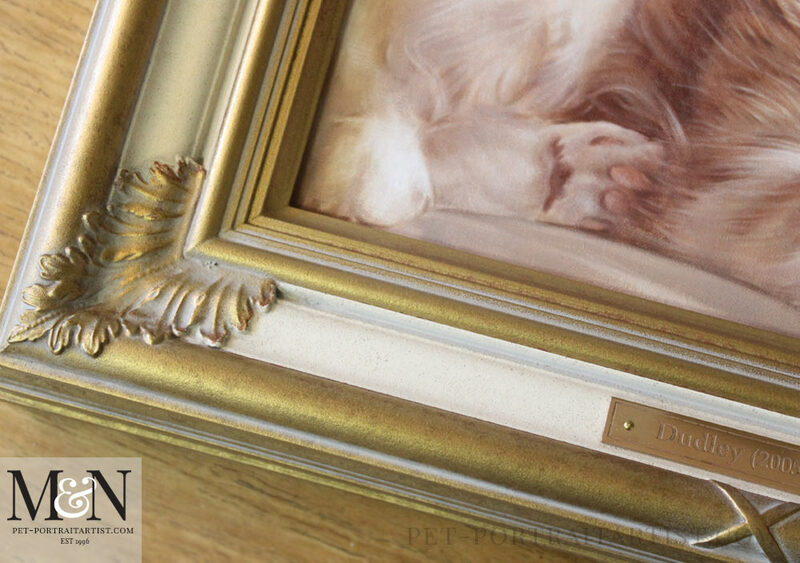 We are thrilled to be able to add the photos of Dudley’s portrait completed and displayed in our clients home. 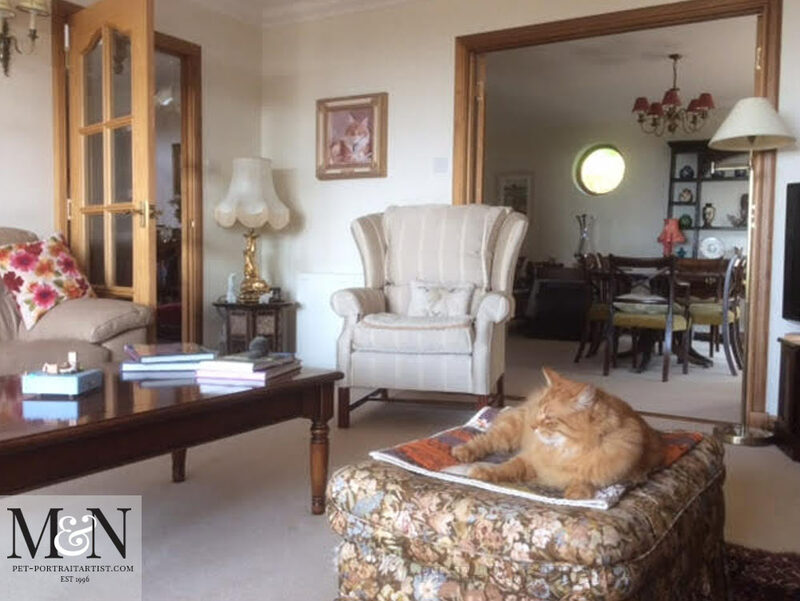 You can also see our clients new cat Roly made an appearance for the photos too! 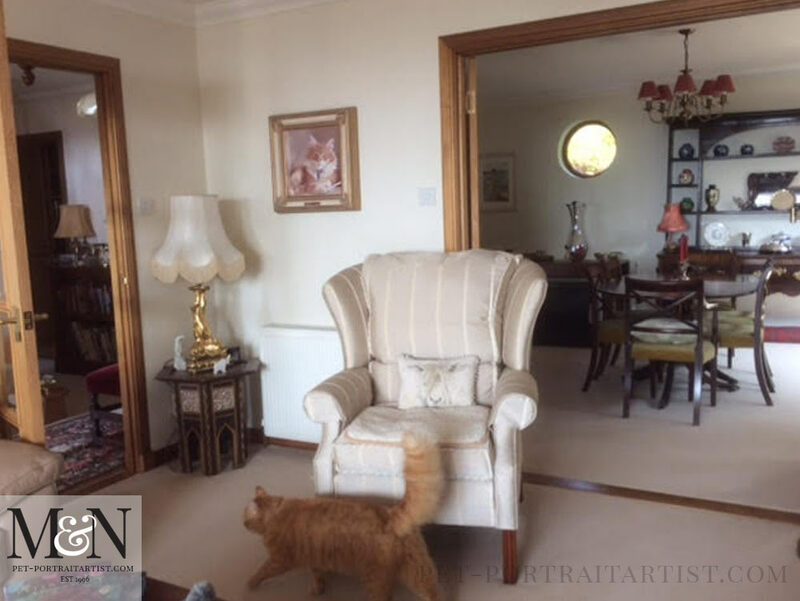 We are absolutely thrilled and delighted that Gordon and Kirstie are happy with their painting as you can read in their testimonial. We cant thank them enough for taking and sharing their photos with us – Thank you!! 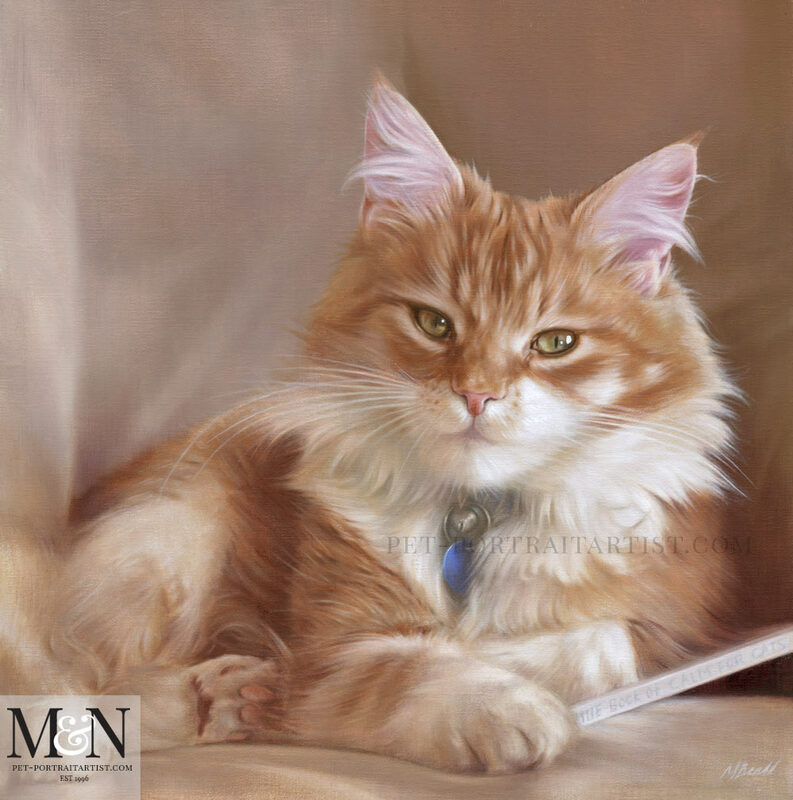 I know you will be relieved to hear that your beautifully packaged parcel has just arrived safely and we have Dudley up on the wall just where we had planned. He is absolutely stunning and we are thrilled! 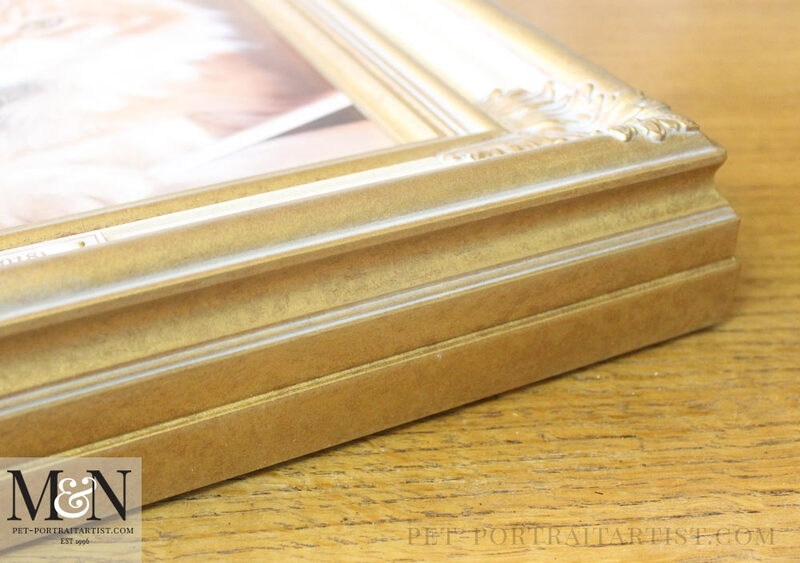 The frame has been a really good choice, perfect colours and not too heavy and we noticed how beautifully it has been finished even to the thoughtful addition of felt pads at the back. Again, very many thanks to you both for all your thoughtful care, attention and amazing talent which have combined to make this commission a huge success. 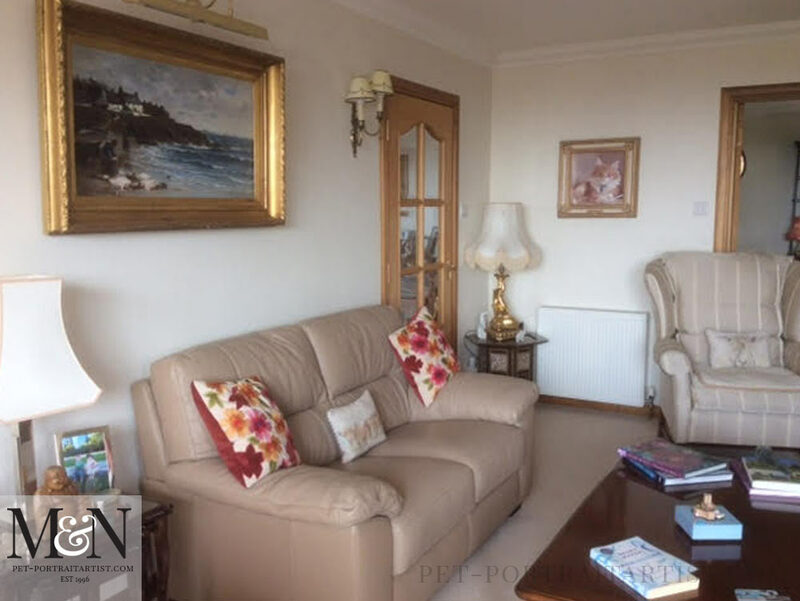 Here are some lovely photos of Dudleys painting completed. I took some candid photos of my plan chest for everyone to see. 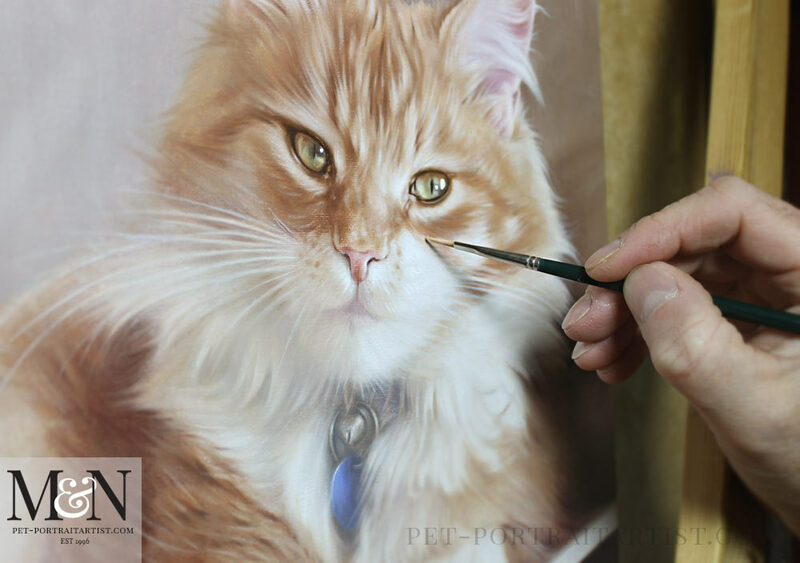 Here are a few photos of the portrait with Nicholas’ hand and brush to show scale. 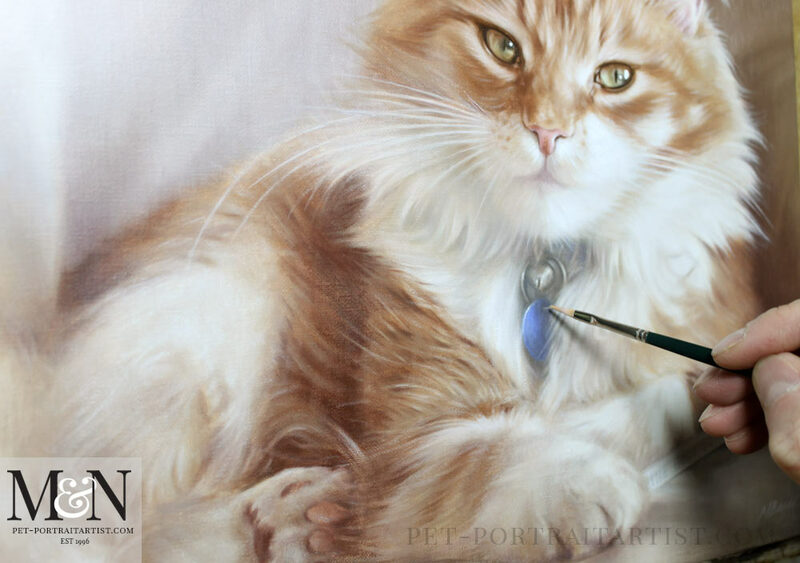 The portrait was still on his easel at this point. 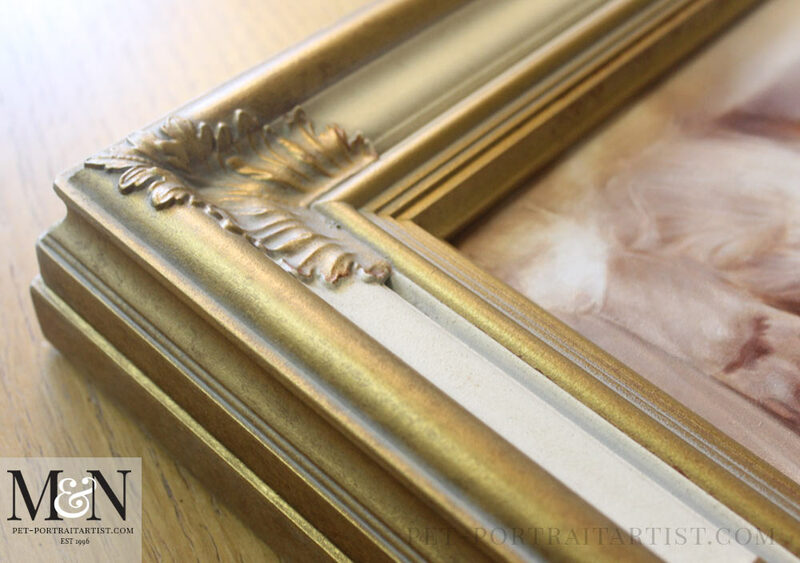 This really helps our viewers get an idea of the overall size of the painting. The colours are beautiful, such a lovely limited pallet.